Michel Platini is not allowed to attend Thursday's emergency meeting at UEFA headquarters. UEFA leaders were meeting Thursday to decide whether to continue backing Michel Platini, with some not yet satisfied by his explanation for a payment that led to his 90-day FIFA suspension. The UEFA president received 2 million Swiss francs (about $2 million) from FIFA in 2011 which, Platini says, was unpaid additional salary from his job as FIFA President Sepp Blatter’s adviser between 1998 and 2002. Platini has not produced a written contract to show the money was owed to him. Because of his ban from any role in soccer, Platini is not allowed to attend Thursday’s emergency meeting at UEFA headquarters. Executive committee member Allan Hansen, who is also a member of FIFA’s audit and compliance committee, said earlier this week he could no longer support Platini if there was no written contract. ”I expect to get some further information because I didn’t so far,” Hansen said as he arrived at Geneva Airport on Thursday. FIFA investigators have yet to be convinced there was even an oral agreement between Platini and Blatter which accounts for the unpaid debt the former France captain called in at the start of 2011. 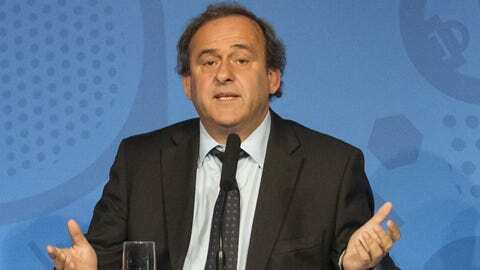 Platini said he did not receive his full salary by 2002 because FIFA could not afford to pay him. Platini and Blatter, who is also serving a 90-day suspension imposed by the FIFA ethics committee, have denied wrongdoing but the payment is being investigated by the Swiss attorney general. ”We need more information, more details,” Romanian federation president Razvan Burleanu said before heading to UEFA headquarters in Nyon for the meeting of all 54 nations. If the explanation received in the meeting is not satisfactory, Burleanu said ”it will be very difficult” to continue backing Platini. Honorary UEFA President Lennart Johansson sat on the FIFA executive committee at the time Platini was Blatter’s adviser and said he did not know about the money owed to the Frenchman. Johansson, who led European soccer until Platini was elected in 2007, said UEFA has been damaged by the FIFA ethics case into its president. Platini still hopes he can clear his name in time to stand in the FIFA presidential election in February, even though he is expected to be declared ineligible once the candidate integrity checks are conducted after Oct. 26. UEFA members want to discuss whether to put forward another candidate in the election. Only Platini and Prince Ali bin al-Hussein of Jordan have said they have submitted their paperwork to FIFA ahead of the deadline for candidates. Platini has retained the support of Polish soccer federation president Zbigniew Boniek, a former teammate at Juventus in the 1980s.